I’d like to have a printer that I could set up in a separate room, without having it connected to a computer or a modem. Ideally, it would work the way a laptop would: It would join my wireless network without cables and show up on my local network so that any computer on the network could use it. I bought a Canon printer that said “wireless” but it turned out to have to be connected to my router or my computer. Not the kind of wireless I wanted. What should I be looking for? There are a couple of ways to go about this. You could purchase Apple’s $99 AirPort Express Base Station, add it to your wireless network, and jack your printer into the Base Station’s USB port. Now launch System Preferences and select Print & Fax. With luck, the printer attached to the Base Station will appear in the list of available printers. If it doesn’t, click the Plus button at the bottom of the list of printers. In the resulting Add Printer window make sure the Default tab is selected. The printer attached to the Base Station should appear in the list of available printers (it will show Bonjour under the Kind heading). Click the Add button. 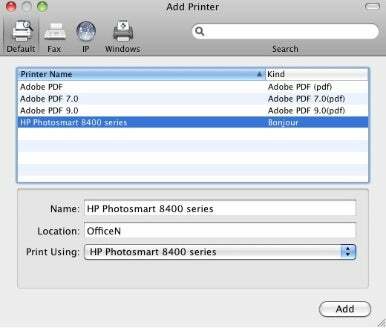 Your printer is now available to any Mac connected to your wireless network. Alternatively you could purchase a Mac-compatible wireless printer. And where would you find such a thing? A good place to start is our list of top-rated wireless printers—a list of wireless printers that Macworld has reviewed in 2010.